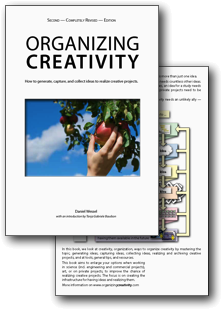 It’s been exactly a year since I made the second edition of “Organizing Creativity” available. To celebrate it’s first birthday, I have decided to make the single-page version available for “free” (also donationware). But note that the graphics are still downscaled — the PDF is great for viewing on a tablet, but not for printing. I need to leave a difference to the single-page version at Lulu. Organizing Creativity PDF double-page version — good if you want to read it on your computer monitor or print it with two “pages” per page (although if you want to read it on paper, buying a printed version of the book is probably easier). Hope you like it. If you like the book and want to return the favor without paying something, recommend the book in your social networks. Perhaps your contacts like it too.